I just received this shoe rack. I ordered it because it seemed like it would save some space. I'm going to put it in my laundry room to use to store gloves and hats. I figured it might help to dry the gloves and hats when they get wet. I like the fact that it spins, and the racks are adjustable. Honey-Can-Do SHO-01197 4-Tier Revolving Shoe Tree, White. Go vertical and store up to 18 pairs of shoes on this bright white shoe tree. With only a single square foot of floor space required, you can reclaim your room and keep your shoe collection accessible and organized. All four levels revolve separately and adjust in height to accommodate small and large shoes, which gives you a flexible storage solution and easy access to every pair. Measuring 11.4 in x 49.2 in H /29 cm x 125 cm H, the durable steel construction withstands daily use. Some assembly required. 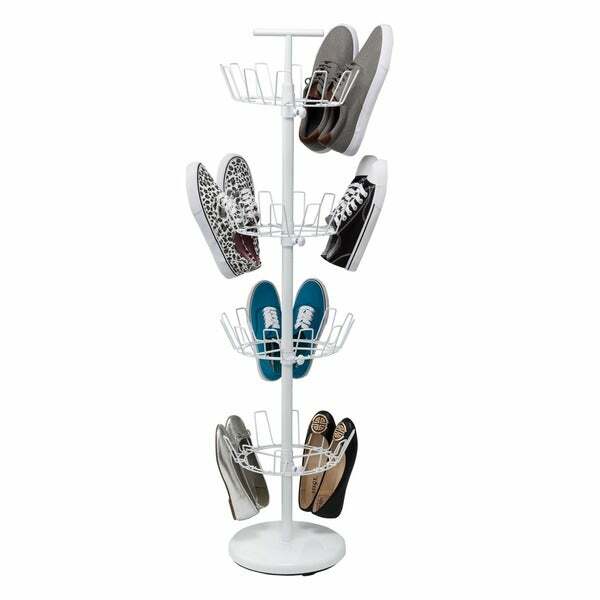 This shoe tree is an excellent space saver and was quite easy to put together. It will easily fit into a corner of a room or tucked away in a closet. If you have a lot of shoes and need more organization this item is a great choice. I really like honey can do products and this shoe stand is no exception. Its tall enough to hold a great amount of my shoes for I have many. Buying this helped me resolve the problem I had such as a small space and lots of shoes between my other and I. However, I find it hard to share this space saver lol. This is wonderful holding up very well. With 7 in our house it gets used a lot. It was easy to put together which is a real treat for me. I would recommend this to anyone. I am going to order more. This is just the right size for a small room. Holds plenty of shoes. You can even hang some purses on it. I am always satisfied with my purchases ar Overstock. My 17 year old son quickly put it together with ease! Holds all the shoes I needed it to and leaves more space on our bedroom floor! Very sturdy as well.